I think it is assumed that DryEagle isn't coming back. FtDLulz from Descent into Darkness thread wrote: Got a reply PM, he pretty much said he's done with FTL and is not going to update. Until I receive a message from him asking me to take this link down, I present an AE update. The old layout was causing a crash, so I had to move the front ship back a tile in order to get it to not crash. (Actually, based on how it used to look, it will look like the back two ships were moved forward.) This will cause a slightly different gameplay experience, but I can't do anything about it. I didn't update the door or sensor graphics either, so the crew won't have a console to play with. Of course, they can still man the stations. edit: It seems my lack of knowledge shall be evident in this. I actually could've moved the whole ship back some, but I'm fine with the current position anyways. I just hope that 5 pixels doesn't cause too many issues with the defense drone when it tries to protect the cockpit. I forgot to mention that I added the hacking in the front ship, and added the mind control and battery to the back ship. I fixed the console glows, cloak image position, and added clone bay support. Last edited by RAD-82 on Wed Oct 07, 2015 5:51 pm, edited 1 time in total. The download link is broken. Unsurprisingly. RAD-82 wrote: I think it is assumed that DryEagle isn't coming back. I strongly suggest you give this its own thread (with links back to this thread). After a couple posts thanking you for the update - that push this thread to a new page - nobody will ever find your link. Which is why you look at the top post of this page and see a link for an updated version. Of course, it wouldn't be posted in a separate thread as a new mod; it would be posted in a separate thread as an old mod. Anyways, I'm not posting it in another thread. Abandon ship saying clearly "I won't update it to even make it working", yet try to stop someone else from posting updated version? Really? That's a douchebag move, to say at least. If he so "oh my copyright", he could just put link to fixed version in first post, himself. Anyway, the copyright law (associated with doing modified work for a copyrighted game, like FTL) is clear, surprisingly, all around the world - anyone can take things he did for the mod, and use it for "other" mod, as long as due credits are given. The usual way of asking for permission is just a "rule of thumb", not necessity - the ship's hull comes from work copyrighted to someone else, anyway, and it's owners (FTL makers) doesn't have anything against derivative works. Summing it up, if no one else get enough guts to just post updated version in a new thread (and save interested people from searching whole thread for a damn working link), I'll do it myself. Of course, giving all due credits to original creator, and person who fixed it. For the full statement by DryEagle, you have to go to the Descent Into Darkness thread. I feel that Estel's response is based on the little tidbit that I copied and so it might be lacking something. So I thought I'd take a peek in. Looked over the last few pages of comments. I find it quite flattering that you guys would go to the effort to update this when it's so old and all that. 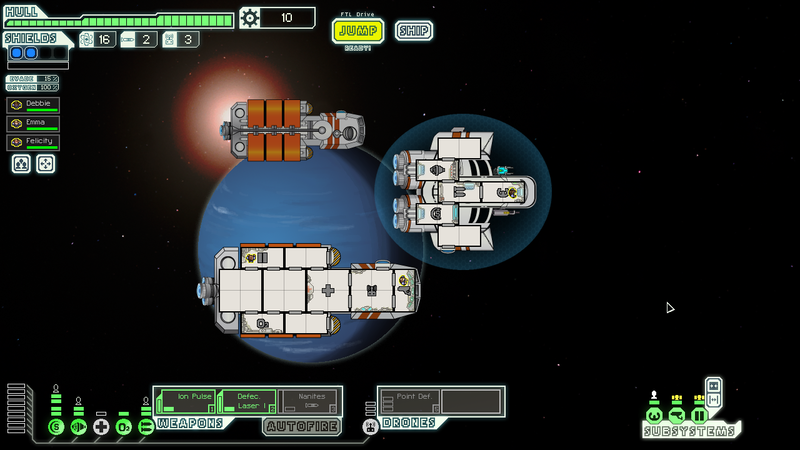 That said, I am entirely done with FTL so don't expect me to do anything else with it. Haven't even played AE to be honest. I've "fiddled" with four ships made by DryEagle, but none of them are on the AE master mod list. I suppose I'll officially request them to be added. From the whole context of his note, it seems pretty clear that what he had in mind was "don't post updated versions of my mod in new thread as YOUR mod", not "don't post them in new thread in any circumstances". not that it does matter much re copyright, but it seems to me that posting updated version in new thread with due credits wouldn't even hurt the "rule of thumb", in the light of whole comment. As long as it is clearly stated who made original mod and - no matter how strange it is - stating that original version haven't had anything to do with AE. damn, are there any other ship mods like this? who are YOU to be reading this?